Today, Tuesday and tomorrow, Wednesday, will continue to focus on yard clean up. We also hope to install the exhaust flue for the first shop stove, and a small contingent will assist in moving b&sr flat 35 to Sheepscot. Mark and I took One pick-up truck load of ashes to the transfer station and One load of old treated wood. Took 2 small loads of soft wood to a neighbor. Moved a lot of short wood blocks around to where they belonged. * Victorian Christmas prep: clean-up, set up, etc. * Bridge ROW south clearing. * New fireman school. We'll need a few for train crew. The hydraulic cylinders from the dozer have been dropped off for repair, and the seal and Speedy Sleeve for the pump arrived Monday, so may try to tackle that Saturday. If that goes good, I would like to go south of the bridge and start clearing the ditch. I would like to clear that before the deeper snows arrive. Probably will not be burning. Probably will not be burning. That's a shame. I picked up a new hat today specifically for the purpose. Well, there is the rest of the winter to break it in. I just don't think there will be enough bodies or time, so not planning on it. Glad to hear about progressing on heating the machine shop in order to proceed with the boilers builds during cold i.e. less than 50 degree inside temperature months. Also was great news about exceeding 21 campaign funding goal! 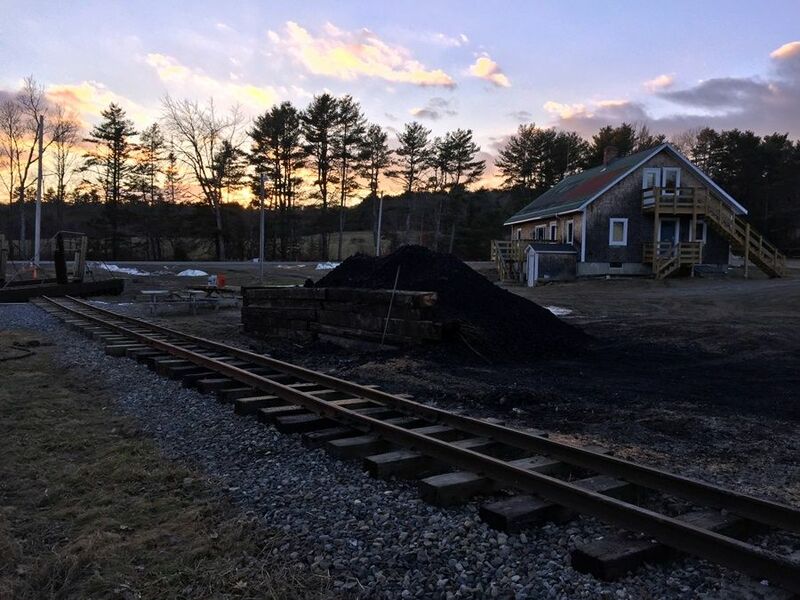 The railroad got a coal delivery Tuesday. 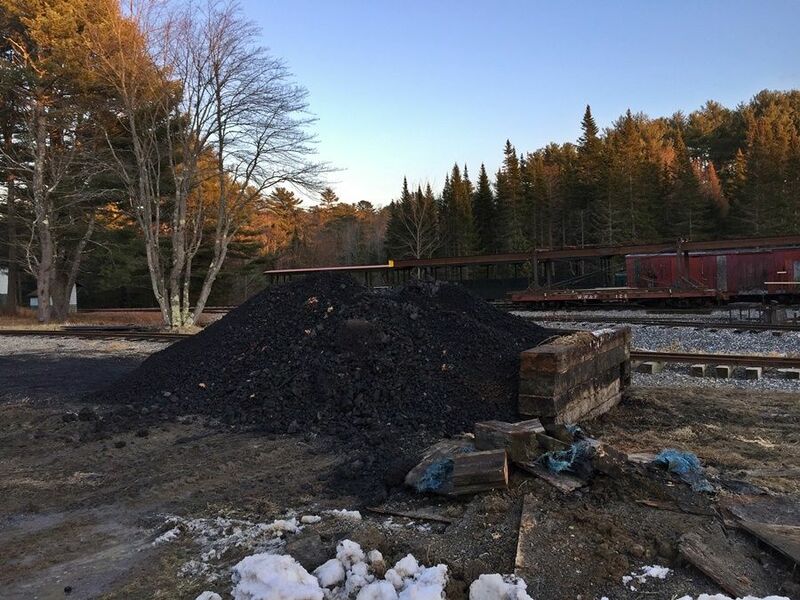 The old coal bin was in sad shape so the remaining coal was moved and the bin was demolished. Fred and I built a new bin today and hauled two pickup truck loads of the old bin off to the dump. After lunch Fred moved the coal into the new bin. We built the new bin with two sides to make tractor access easier. Fred said that the coal was frozen in the dump bed of the truck. I bet that it took a while to get it out. We really need a real coal storage bin with a cement pad to avoid the dirt in the coal. That makes for a very crummy fire. Wondering if the ML&M switch got ballast and tamping yet? Ballast last week Gawdon. No tamping yet..
On the subject of locomotive coal, there is no point in paying good money for good coal and then mixing with dirt to make clinker. A concrete pad for the front-end losing of coal needs to be a high priority. The way the coal was frozen, it made a long, long dragged out pile. even if we had a cement pad it would have come out way beyond the pad. Also the truck arrived a day or Two early. I guess we should buy coal in warmer weather. The driver was 3 hours getting it out. The old style coal pit would have worked well for a cement pad, as the coal is contained within the walls and on the pad. Or even if some spills, it will make a majority of the pile dirt free. Coal and dirt burn kind of ok in a stove, but not in a high heat force drafted fire. However if we have a cement pad, it would be nice to see it placed where the coal pile will be permanently located. Unless we set up a way to build the pad for the roundhouse and set it up there temporarily.